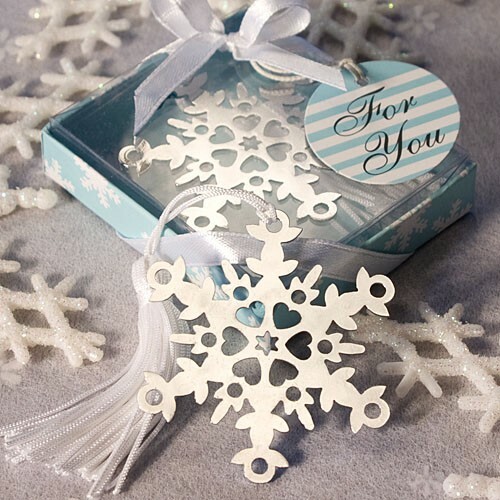 Perfect for a winter wedding or any elegant affair, our Let It Snow Collection snowflake bookmark favor is one of a kind. Everyone loves to curl up with a favorite book on a snowy winter's day. And these elegant snowflake bookmark favors make each relaxing reading session a memory filled experience. Measuring 5.25" long (including the tassel) by 2" wide, each exclusive Let It Snow bookmark features a delightfully detailed silver metal snowflake page marker with an attached white tassel that peaks out of the book. Each snowflake bookmark favor comes attractively packaged in a Let It Snow Collection signature box with a winter blue/snowflake design base and clear top, tied with a white satin bow and an attached round ice blue and white striped "For You" tag. 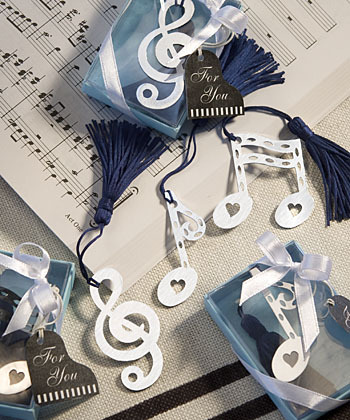 Your guests will be singing a happy tune when they receive these musical note bookmarks as their favors. You're sure to hit a high note and receive rave reviews with these whimsical musical note bookmarks as your event favors. From Fashioncraft's exclusive Book Lovers Collection, the favors are sold in an assortment of three musical notes ranging in size from 5" to 5.5" long (including the tassel) and 1" to 1.75" wide. Each favor features a bold silver metal musical note charm with cutout details and an attached blue tassel that peaks out of the book for easy page finding. Destined to make a great impression, each comes packaged in a clear topped box with a teal base, tied with a white satin bow and an attached "For You" tag with a piano themed design. 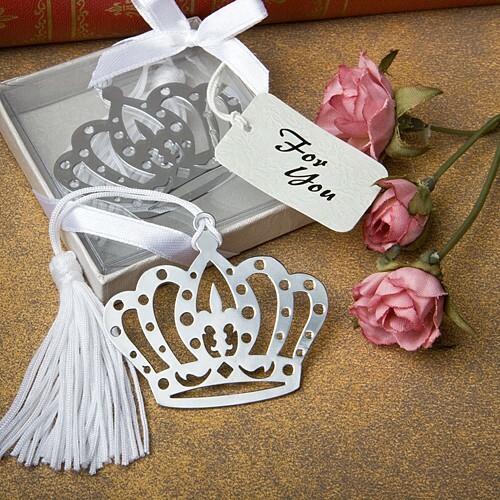 Greet your guests in royal fashion with these crown design bookmark favors. Whether you're celebrating a Sweet Sixteen, wedding, shower or other special occasion, these crown design favors are bound to fill the room with castle-worthy appeal. Each favor measures 1.875" x 1" (6" in length including tassel) and has a cutout shiny silver metal crown charm with a central fleur di lis design and an attached white satin tassel attached at its top for marking your last-read page. Also great as French themed favors or fairy tale favors, each crown bookmark comes packaged in a clear topped box with a silver base with an embossed rose design, wrapped with a white satin ribbon and an attached white 'For You' tag with a subtle rose design.